Bikeway data now available Metro developer site. Here’s some awesome news for anyone who wants to include bikeways in new or existing transportation, trip planning and geographic analysis tools in L.A. County. Metro has officially released all of its bikeway data gathered from 88 cities at http://developer.metro.net. The data, following on the agency’s previous release of its transit data last year, is designed to help web and app developers create their own bike map information and show the geographic location of bikeways in L.A. County. The bikeway data includes, among others, designated bike paths, lanes and routes. By releasing the data to developers, Metro hopes to encourage broader awareness for the region’s overall bikeway network and to further promote cycling as a viable multi-modal option for traveling to destinations throughout the county. The data comes from Metro’s Bicycle Planning team, which collected, refined and standardized the info for the new Metro Bike Map published last spring. The agency says it now plans to update the bike map every two to three years. Here’s what you get when you download the data. An excel spreadsheet listing bikeway segment names, class designation, starting and ending points, and an index number. Bikeway spatial data in KML, which is a file format used to display geographic data in a map viewer such as Google Earth, Google Maps and Google Maps for mobile. This format allows the greatest number of users to review and utilize. Shapefile versions may be released at a later date. As many of you who bicycle in L.A. already know, Google Maps has bikeway data on its site for a while, which allows users to include bikeway options in planning their trip. The data set collected by the agency is more comprehensive, maintainable and accessible. It’s available to everyone and you can do more than just obtain bicycle routing info. For instance, it can be used in ways that enhance geographic analysis to help communities identify where opportunities and/or obstacles exist for bicycling. Apparently, there are already sites that have utilized this data. The data has been incorporated into bikeatlas.org. There will obviously be more uses for the data by future developers. 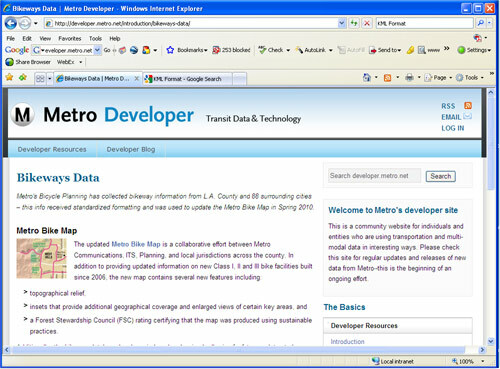 Be sure to let us know of any new application of Metro bike data on the Source or on Metro’s developer site, a community website for individuals and entities who are using transportation and multi-modal data. Footnote: Hats off to former Metro bicycle program intern Nate Baird for putting the map and data together. He now joins the city of L.A. bicycle program).